LINCAT Part Number: EL218 0.74kW DISPLAY HEATING ELEMENT FOR HEATED DISPLAYS. 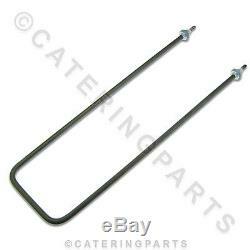 This fixed price listing is for 1 x Pre-Bent Heating Element as shown in the item picture below. Fits various models of Lincat appliances including: Heated Displays LPW, LPW/LR (POST FEB 2004) Rectangular Heated Merchandisers (350) D3H/75 This element is rated at 0.75kw (750w) and is 240V. Measures approx 125mm width x 450mm length. Heating Elements - Important Note Please note that electric heating elements are. For this reason heating elements. If you require any other spare parts or accessories for your appliance visit the Lincat section. To see our huge range of catering parts. Please see our other items for more spare parts related to this listing. We are an established Vat registered, limited company with an enviable reputation to protect (no dodgy second hand faulty, stolen or recalled products found here). Our prices INCLUDE VAT (no hidden extras). At the feedback left by 1000's of other satisfied customers. We are easily accessible located near the M1/M62 interchange. We ask that you include a contact telephone number when completing the sale for us to place on the couriers manifest, our couriers will not take parcels without a contact number. A signature is required for each parcel. Please unpack and check all items before signing for them, we can not be held responsible for any items that have been signed for as ok and then later reported as damaged. OTHER INFORMATION Many of the parts on sale are supplied by the original equipment manufacturers (OEM) whilst others are offered as suitable replacements or alternatives. Parts supplied as alternatives may differ from the OEM's exact specifications. Any pictures shown are stock photo's and exact colours or shades may vary from the picture. The item "LINCAT EL218 LPW D3H/75 PIE WARMER HOT HEATED FOOD DISPLAY CASE HEATING ELEMENT" is in sale since Thursday, August 4, 2011.